Controversial Chief Secretary of the Bougainville Administration has been terminated from office. 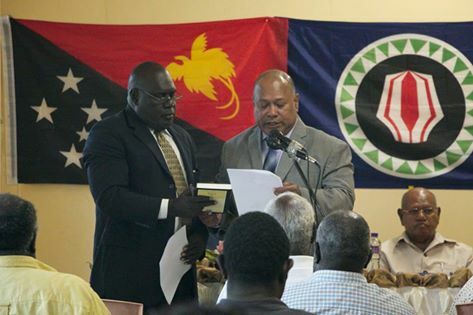 Monovi Amani who only served ten months before being suspended for alleged misconduct in office was officially removed from office on Tuesday this week by the Bougainville Senior Appointments Committee. The appointments committee chaired by the President of the Autonomous Government Chief Dr. John Momis effected the termination based on findings by the board of inquiry that was established to investigate 6 separate misconduct allegations. The inquiry was conducted by a single investigator, a former Chief Ombudsman Ila Geno, who uncovered unscrupulous deals the former Chief Secretary involved in. The board of inquiry found that Mr. Amani took unapproved recreation leave; used public funds to purchase flights which he was not entitled to, including flights to an overseas destination and falsely claiming that some of the flights were for official purposes; received housing and vehicle allowance to which he was not entitled to; made an appointment to the Bougfainville Public Service in contravention of the legal requirements; used his position to secure and approve a substantial amount of money through the Bougainville Tenders Board without ensuring that such payment was proper and entered into a contract on behalf of the ABG for construction of his official residence with a company owned by a relative. Former Chief Ombudsman Ila Geno after completing his investigation made a presentation to the Bougainville Senior Appointments Committee this week and referred to the quote from the Constitutional Planning Committee when discussing leadership. "In his public office, a leaders first responsibility is to the people he or she represents or on whose behalf he is working. This responsibility must override self interest. A leaders first loyalty must be his office, not himself. The higher the office held in the state, the more serious the office holders responsibility." Monovi Amani had been suspended in November 2015 to allow for investigations into the allegations and Paul Kebori was appointed to act as Chief Secretary. Kebori told NBC News this afternoon, the ABG has now gone ahead to engage a private recruitment company in Port Moresby to advertise the Chief Secretary and six departmental head positions for the ABG Administration. Monovi Amani also tells NBC News he has accepted the decision by the single man board of inquiry.